The Triassic Period is the first period of the Mesozoic Era. The great extinction at the end of the Permian period had brought the end to 90% of the living species on Earth. The Triassic was a time of growing new species to repopulate the planet. This time was the beginning of a new era, the Mesozoic Era. Geologists call it a new era because the life supported on the continents was so different from life during the Paleozoic Era. During the Paleozoic, most life had been in the sea. It was only at the end of the Paleozoic that life had gradually moved onto land and begun to develop animal and plant species that could live out of the water. The Mesozoic Era is called the Age of Reptiles. But that only tells a small part of the story. Just like the Paleozoic Era, the Mesozoic is divided into periods. Each period has specific land forms and climates, so each period has special animals and plants that developed. The Mesozoic Era is divided into three periods: the Triassic Period, the Jurassic Period,, and the Cretaceous Period. The Triassic began around 248 million years ago, after the mass extinction that brought an end to the Permian Period. It lasted about 42 million years. The Triassic Period ended around 206 million years ago. It had a special climate because of the way the land was placed on the Earth. At the beginning of the Triassic, the land was all together in one supercontinent, Pangea. It straddled the equator, so the climate was warm. Pangea was shaped like a giant “C” with the opening surrounding the Tethys Sea. All around the outside edges of Pangea was the Panthalassia Ocean. There were no shallow seas surrounding Pangea. The shape of Pangea kept the Panthalassia Ocean waters from bringing cool, moist air to any parts except the coast. This made the inland areas dry and desert-like. Pangea started to break up almost as soon as it was formed. By the middle of the period, the continent was on its way to becoming two super continents. The sea floor was spreading along a rift at the bottom of the Tethys Sea. It was forcing Pangea apart. The part of Pangea above the equator was Laurasia. It was a combination of North America and Eurasia. As the sea floor pulled apart, Laurasia moved to the north. The other part, Gondwana, moved to the south. It was made up of Africa, South America, India, Antarctica and Australia. On the ocean side of Pangea, mountains were just beginning to form. Volcanoes erupted where the plates were moving. One plate was being forced under another. These were the beginnings of the Sierra Nevada mountain range. Most of the western part of North America was under water during the Triassic. The new mountains looked like a line of islands in this ocean. Many species that survived the Permian Extinction died out during the early part of the Triassic. Trilobites, bryozoans, and rugose (horn) corals all disappeared. But many new species developed. The ammonites and brachiopods survived and began to recover. One type of ammonite was especially plentiful during the Triassic Period. The suture lines are lines between the sections of the ammonite. When the suture lines formed a wavy pattern, it is called a ceratitic ammonite. There were many ceratitic ammonites in the Triassic seas. A completely new invertebrate species that developed in the Triassic was the belemnite. Belemnites were a mollusk that belonged to the class cephalopoda. The belemnites had no external skeleton like their earlier relatives, the orthoceras, their relative the ammonite. Instead, they had an internal skeleton. 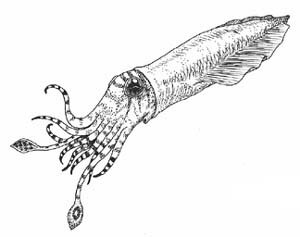 Squids are a modern-day relative of the belemnite. The most important development was happening to the reptiles. These animals would dominate the land, sea and air throughout the Mesozoic Era. During the early part of the Triassic Period, when Pangea was still one huge supercontinent, the reptiles were more adaptable to the hot dry lands. The cold-blooded reptiles seemed to live better in the desert-like land environment than the Therapsids, or mammal-like retiles. Many different species of the cold-blooded reptiles developed during this time. Also, the first dinosaurs were evolving. The dinosaurs were different from the reptiles. First, they were warm-blooded. This means the temperature of their blood was kept constant inside their body instead of changing with the outside temperature. Second, their bone structure was different in the hips, legs and hands. Most dinosaur species lived after the Triassic Period. They would come to dominate the Jurassic and Cretaceous periods. Another land animal developing around the same time as the dinosaurs were the mammals. These mammals were very small. They weren’t very important until millions of years later in the Cenozoic Era. 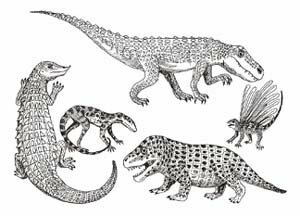 There were many reptiles living in the Triassic seas. Ichthyosaurs developed in the Triassic period. They had a fish-like body so would have spent their life in the seas. But, they breathed with lungs and did not have gills. The plesiosaurs also developed during the Triassic. Like the ichthyosaurs, they would grow in numbers through the Jurassic and Cretaceous periods. The end of the Triassic period saw flying retiles develop. These animals were called pterosaurs. Most of the species of this group became important in the Jurassic and Cretaceous periods. 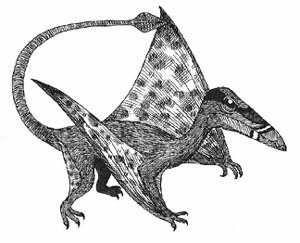 The flying reptiles were not relatives of birds. In fact, dinosaurs are more closely related to modern birds. During the late Permian Period, or Pennsylvanian Epoch, the coal swamp plants were the most important. These tree-ferns and lycopods could not live in the dry climate of the Triassic Period. Instead, the conifers and ginkgos survived the Permian extinction and developed during the Triassic. The evergreen plants were much more able to cope with the dry climates. Many of the important species of both plants and animals got their start during the Triassic Period. It was a time of transition. The few species that survived the Permian mass extinction were growing into new species. The extinction that marked the end of the Triassic Period seemed small compared to the one that ended the Permian Period. Only about 20% of life in the oceans and on land died out completely. The species that were affected came back with strength and would soon dominate the world of the Jurassic and Cretaceous Periods.